Note for PC users of Microsoft Windows 98 or later with a 300MHz Pentium/Celeron processor, 32MB RAM, 400Mb Hard Disk Space and a Direct X compatible graphics card need to mount a 'Virtual Acorn' program before trying to run any of these programs. Details from the website http://www.virtualacorn.co.uk. We know of 6 programs for RISCOS computers. They are all useful in different ways to people at different stages of learning to ring. !AGBells a program which was written to print out the 'blue line' for Suprise Major methods. It has a few other methods and allows the user to enter 'Place' notation' for others. Bells and Bell Ringing an excellent program for display at 'Open Tower' Days, in schools, or to help complete beginners understand how and why bells are rung. It is multimedia program with both pictures and sound written by Anne Parmenter, whose untimely death was reported in 'The Ringing World' September 29th 2006. Click here for details including how to download (RISC OS and PC versions). !CallChnge displays a set of animated ringers and bells busy ringing rounds and allows you to change their order interactively. The changes can be saved, replayed and saved to a file. It is useful for beginners to listen to named changes, or for those just starting to learn to 'call'. Click here for details including how to download it and for a manual in PDF format. !Methods animates a band of from 4 to 16 bellringers ringing standard methods. You can simulate conducting in the tower and save the method 'Diagram' to a Draw file with red and blue lines. Click here to see more details and to download the demo version. !Strike Simulates accurate repeatable striking errors and provides feedback on your ability to detect and correct them. See his web site. 'ring' your own bell from the keyboard or from a sensor attached to a dumbbell or silenced tower bell. 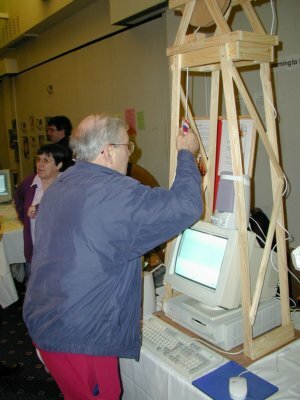 The picture shows Alan Griffin ringing the dumbbell at the 2005 RISCOS SW show. !Stringing is running on the RISC-PC below and is connected to the dumbbell. If you have further information about bells and bell ringing please let us know.